Which blog post do you prefer? Hi, viewers. dogpowerbywintergirl.net is my blog. It has been advertised a lot on epicchasgamer.com, Chas’s blog. But not for fun. For followers!!! I have about six followers. I need your help to make them increase!!! Come on, viewers, PLEASE follow me!!! Can’t you understand how desperate I am right now? My blog is about making people happy and to make them enjoy themselves reading my blog. It has posts about gaming, animals; especially those in the dog family, advertisements of the blog itself and edited versions of other posts. 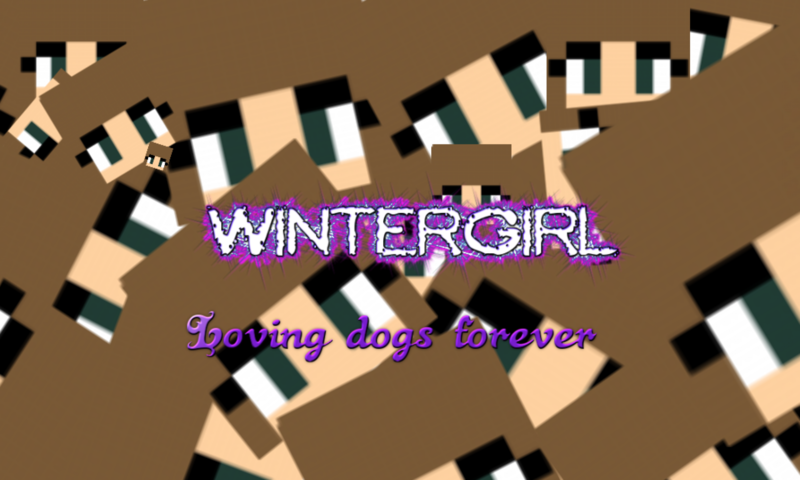 Feel free to follow dogpowerbywintergirl.net!!! P. S. Don’t forget to follow!!! You choose which one is best and I’ll create a poll for my next post. Shield Evil was sat in his castle feeling very lonely and annoyed. Why should he be sat on his own and not be creating havoc? He always made Sir Wolf and his friends very angry. Most people would hate upsetting people but not Shield Evil. He found it hilarious when he saw Sir Wolf’s anger in his face. Sorry for the shortness of this post. I hope you enjoyed the first part of my story. Here are some pictures I have created on Paint 3D and on a logo maker called cool text and on another logo maker called flaming text. I think both logo makers might have been created by the same person but I am not sure. Hey! WinterGirl! You didn’t let me sign your post when I’m the blog mascot! The castle burglar alarm went off and every single wolf screamed apart from Poppy, the invincible wolf cub. WinterGirl turned to Chas. “Seeing as you are temporarily king, maybe you should sort something out!” she exclaimed, amazed that someone who definitely wasn’t Shield Evil had planned to attack the castle on Halloween. This certainly was a wolf. But why would it betray the castle? “Who on Earth would want to attack us apart from Shield Evil?” Prince Wolf thought aloud, as he stumbled out of the royal tower, half asleep. “It looks like one of the wolves. It must have cloned itself lots of times,” replied Chas. “Stop saying “Maybe, just maybe…” It’s getting annoying,” interrupted Chas, annoyingly. Suddenly the master of the clones started laughing and laughing. The clones copied. “Oh, WinterGirl, oh WinterGirl, you are so clever! Oh WinterGirl, oh WinterGirl, you worked it out sooner than we expected! Oh WinterGirl, oh WinterGirl…” the master of the clones exclaimed before Chas rudely interrupted. “Oh Chas, oh Chas, I’ll stop!” the master of the clones, whose real name was Push-the-wall-please, laughed, which annoyed Chas a bit but eventually he laughed too, along with the others. HAPPY HALLOWEEN to everyone who appreciates my blog when it actually is Halloween.